Life changes forever when Mary’s family dies of the pestilence. She finds herself in the streets of London with only the clothes on her back, which are soon stolen by a gang of urchins, who then adopt her into their group. Charlie, Polly, Judy, Nancy, and Hugh teach Mary how to survive on the streets. egging, thieving, and running from the law become second nature to her. Then someone murders Charlie and Mary decides life is far too dangerous for a girl, so she disguises herself as a boy and becomes Jack Faber. 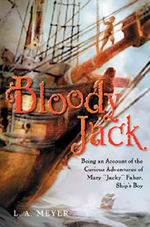 Jack signs aboard the Dolphin as a ship’s boy, along with five others – Benjy, Tink, Willy, Davy, and Jaimy. At twelve, Jack is now in the Royal Navy bound for the Mediterranean and Caribbean to hunt pirates and learn the life of a mariner. The ships’ boys form a secret club, which causes a few problems for Jack, but she learns to adapt while hiding her secret. What she doesn’t count on are becoming a woman, falling in love, defending her life from an enemy within, fighting pirates, and participating in a frightening scientific experiment. Adventure abounds within the pages of this coming-of-age tale, but Mr. Meyer never allows romanticism and glamour to interfere with a vividly true rendering of life at sea in the late eighteenth century. Jack never forgets she’s a girl, but devises some ingenious ways to hide that fact from others. Preteens and young adults who have faced adversity will readily identify with Jack. 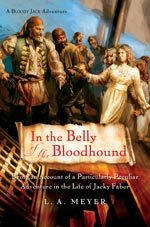 Some may have a bit of trouble with the dialect, but as Jack ages and the story progresses, her speech helps propel the reader back in time to 1797 when Britain ruled the seas. In London to hook up with her beloved Jaimy, Jacky Faber spies him holding hands with another girl, destroying Jacky’s dreams of marriage and family. Too angry to listen to explanations, she flees. A press gang mistakes her for a man, and once again she finds herself serving in the Royal Navy. Even though she reveals her true identity to the captain, he refuses to dismiss her, for he wants to bed her with or without her permission. Thus begins Jacky’s newest nautical adventure that includes smugglers, spies, sea battles, her own ship, and being declared a pirate. Written for young adults, this third book in the Bloody Jack Adventures series will enthrall readers as much as the first. Headstrong and rash, Jacky nevertheless finds intriguing solutions to the dilemmas she faces. The twists and turns will keep readers guessing until the very end. 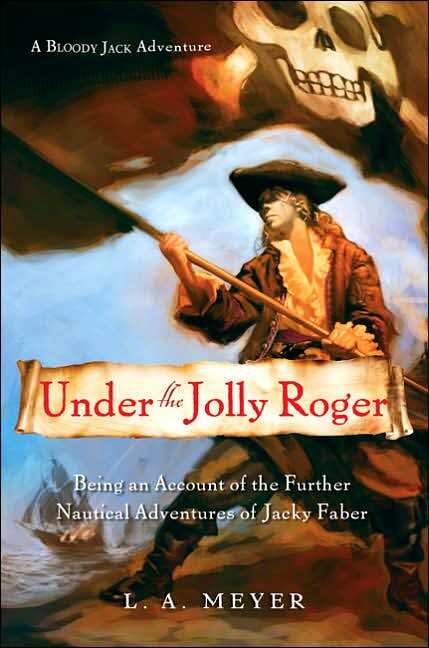 Once again Jacky Faber, formerly of the Royal Navy and a wanted pirate, finds herself in the midst of trouble. Laying low, she makes her way to Boston, where she renews her acquaintance with trusted friends. She also resumes her studies at the Lawson Peabody School for Young Girls. Ezra Pickering, Esquire, her lawyer, oversees her finances and makes certain that correspondence for and from Jamie Fletcher, her true love, gets through. While she tries to settle into a sedate life with her fellow schoolmates, Jacky can’t forget the horrors she witnessed at the Battle of Trafalgar. Her wounded mates’ screams plague her dreams, and sometimes she falls into deep bouts of despair. When Higgins, her former valet, arrives at the school, she finally feels less lost. Mistress Pimm, the Headmistress, also finds Higgins an essential addition to her staff. She arranges for the girls to go on a picnic and field trip to a nearby island. The day of the affair, however, Higgins and Pimm mysteriously fall ill, but Jacky doesn’t realize the adults are missing until they reach the island. The day doesn’t quite go as planned. The dandy who arranged the field trip turns out to work for slavers, and the girls find themselves locked in the dark, rat-infested hold of a slave ship. Their destination? The slave markets of North Africa. Ever resourceful, Jacky keeps her wits about her and soon formulates a plan. She requires, however, the assistance of her nemesis and fellow classmate, Clarissa. If they can set aside their differences and work together, the girls just might have a chance to escape. This fourth installment in the Bloody Jack Adventure series for teenagers is a rousing story laced with old friends, intrigue, despair, teamwork, and hope. Now sixteen, Jacky has matured into a young lady with a head on her shoulders. If not for her many escapades and escapes, the girls might well find themselves sold into slavery. As she combines ingenuity and knowledge with the skills each girl has, Jacky learns that everyone has worth and sometimes even enemies can be friends. Another excellent, albeit particularly peculiar, tale about Jacky that will astound readers and make them cheer for the underdog! 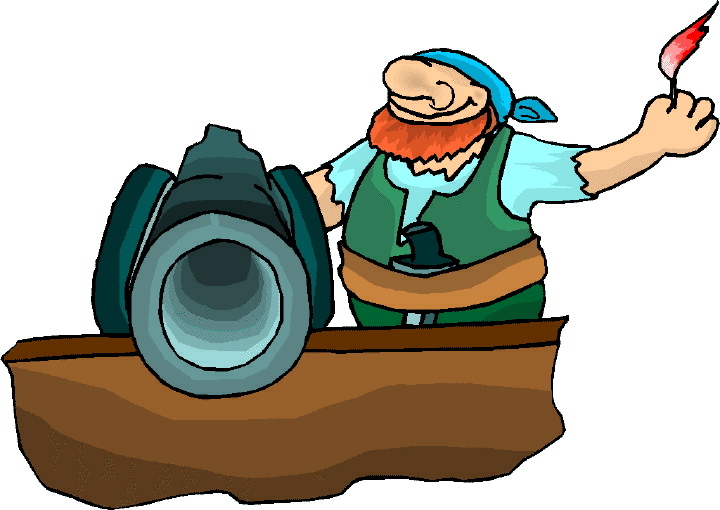 Since the Crown needs money, Jacky must dive in deep waters off Key West with the assistance of a new invention, a diving bell, on a sunken treasure-laden galleon. But Spain claims those islands and waters, and although Jacky and her mates masquerade as American sponge divers on a science expedition, she quickly makes a dangerous enemy, a Spanish lieutenant who vows to bring her down. Plus, if the Spaniards discover her true identity, they might remember she pirated in these waters, and Spain doesn’t take kindly to pirates. Although I read this entire book, I was tempted to put it aside several times. Perhaps it's because this Jacky is older than the character I first cheered for. Perhaps it's because she carries the less attractive traits common to seamen too well. Perhaps it's the frequent sexual references, while mild, that detract from the story. Yes, Jacky is growing up and in love, but there are times when that love seems to be sprinkled a bit too broadly around among her other male friends. Another drawback, for me, was repetition of information and the length of this story. Not until the last ten chapters does the action truly grab the reader's attention and keep you riveted. 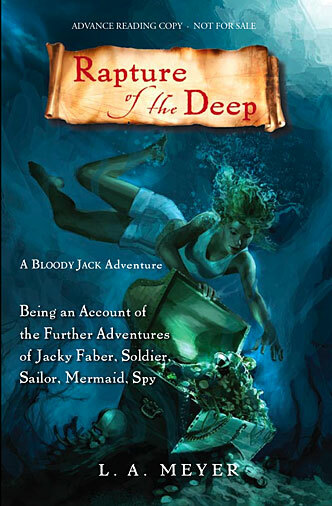 Those readers who have followed Jacky's pursuits since the first book will enjoy Rapture of the Deep, I'm certain, but for those unfamiliar with this character, I recommend starting with Bloody Jack.